The town Höfn is located in the south-east part of Iceland. It’s located by sea and is a very important fishing village. 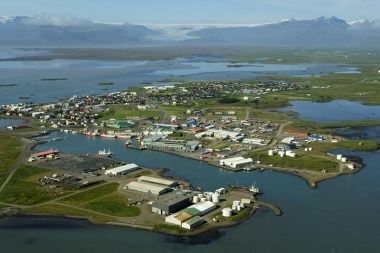 It’s a part of the Hornafjörður municipality and it’s located near many famous tourist spots, for example Vatnajökull glacier, the biggest glacier in Europe, the glacier lagoon Jökulsárlón and The National Park Vatnajökulsþjóðgarður. The population of the whole municipality is approximately 2150 people. There are a lot of farms in the area and many of them produce milk, wool, meat and eggs. Many of the farms have branched out and have opened guesthouses or hotels for tourists. The oldest account of people living in Höfn is from the year 1897 and the town became a trading centre and the only densely populated place in that area. The population grew slowly because there weren’t many work opportunities except fishing and meat processing. In 1920 there was an increase in the fishing industry in Höfn and it became the most important fishing town in the eastern part of the country. In the 60’s there was even more increase in the fishing industry when lobster fishing began, and since then Höfn has been known for its lobster. From 1993 there has been held a lobster festival, or Humarhátíð as we call it. At first it was held on the first weekend in July, but now it’s held on the last weekend in June. It is one of the main events in the town and many people around the country visit the town during the festival. At the festival a stage is set up by the harbour and artists and comedians perform and then people eat a lot of lobster. In Iceland kids go to elementary school for 10 years and they are split up to grades 1-10. For example when you’re 6 years old you start 1st grade and you finish 10th grade when you’re 16. In Höfn there are two elementary schools. Hafnarskóli which is for 1st-6th grade and Heppuskóli which is for 7th-10th grade. It is essentially the same school, just in different buildings. And then there are also two preschools for 1-5 years old. In Höfn there is also a music school, Tónskóli Austur-Skaftafellssýslu. It was opened in 1969 and has been active since then. There you can learn to play many instruments, such as piano, keyboard, guitar, clarinet, flute, saxophone, trumpet and many more. There is also a marching band there and other bands that play at events in the town. The upper secondary school, Framhaldsskólinn í Austur-Skaftafellssýslu, or FAS like it’s usually called was founded in the year 1987. At first it was located a short distance from the town, but in 2002 it was moved to the town and has been there since. About 150 students are in the school and staff members are 24. In the school you can choose between academic departments and each department focuses on different things. The main departments are social studies and natural science. The school mostly focuses on theoretical study but there are a few vocational courses that you can choose from. The last few years’ arts and crafts courses have become more important both for pupils and the community. The school also focuses on studying trips, e.g. to measure plants and glaciers in the area. The school is one of the smallest upper secondary school in Iceland and since it is so small there aren’t so many organized activities, but there are game nights, movie nights, school dances and few other different types of social outings. FAS is located in the building we call Nýheimar which means the new world. In the building there are many different institutions, such as the local library and a branch from the University of Iceland and a lot of other smaller institutions. Skinney-Þinganes is a fishing company and a fishing processing plant in Höfn and has about 150 to 170 employees that are involved in the processing stage. All in all there are about 240 to 260 employees that work there. Skinney has been one of the biggest employers in the town for teens during their summer break. The company has two big boats that are pelagic fishing vessels and a few multipurpose vessels. There are two designers in the town. They are Ragnheiður Hrafnkelsdóttir with Millibör and Ágústa Margrét Arnardóttir with Arfleið. Millbör’s designs draws inspiration from the sea and the creatures in it. Millibör makes all types of women’s clothing and accessories. Afleifð´s designer works with organic materials like fish skin and furs of animals and other kind of animal skins. Arfleifð makes handbags, belts and a lot of cool clothing and accessories. One of the designers is teaching a class at FAS where the students learn to design and sew clothing, like pants, dresses, skirts and shirts.